Manual paper trimmer MT01, for large format cutting, with size 64"-1600mm, 104''-2600mm. Suitable for cutting advertising coiled materials and soften foam boards. Improves working efficiency. 1. 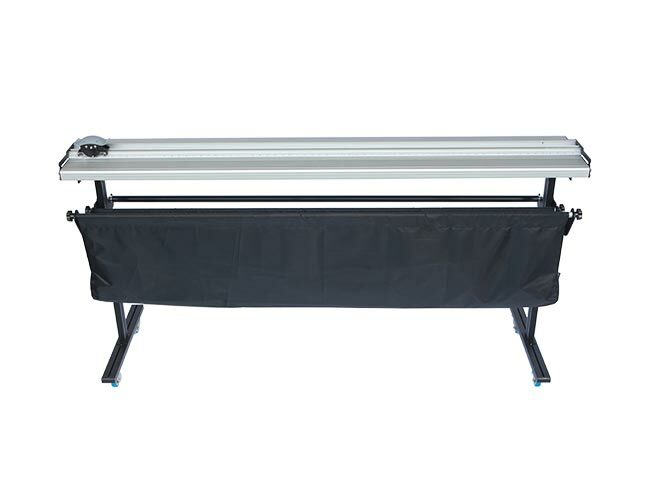 Our manual paper trimmer is widely used in advertising making, exhibition organizers,picture production, studio and many other fields. Ⅰ.Adjustable blade depth, max to 12mm thickness material. Ⅱ.Unique design safety cover, avoid injury during working. Ⅳ.Big waste catcher keeps your workplace clean and tidy. MT01 How to change the paper trimmer blade? 1. Q:What kind of material can it cut? 2. Q:Does it workable for cutting vinyl? 3. Q:What’s the life of blade? A:The blade belongs to consumable item and needs to be replaced according to your workload requirements. 4. Q: Is the blade easy for replacement? 5. Q: How many sizes does it has? A: Two sizes: 64”(1600mm) & 104”(2600mm). 6. Q: Is the blade included? A: Each paper cutter comes with a box of blades (10 pieces). 7.Q: Is the blade easy for purchase? A:Blade can be purchased from us or from the local market. 8.Q: How thick can it cut? 9. Q:Does it has a waste catcher? 10. Q: Can I use the cutting worktable separately without stand holder? 11. Q: How about the outer packing? A:1 set/ PKG. MT01-1600 is packed by honeycomb carton packing; MT01-2600 is packed by non-fumigated wooden box packing.